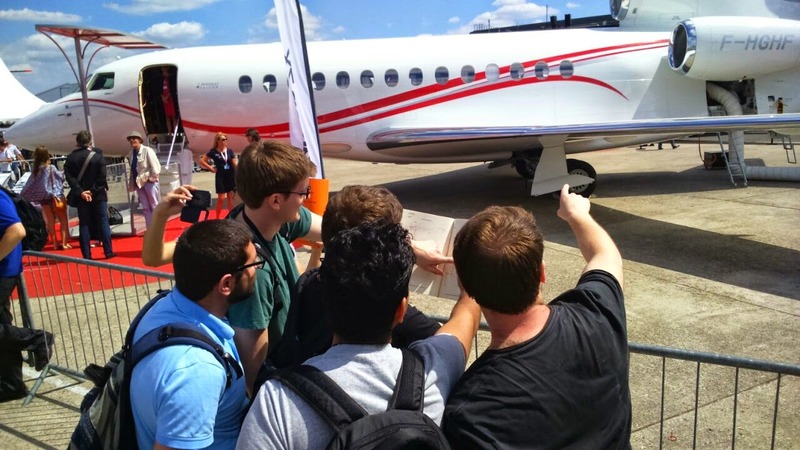 I was very fortunate to attend theSalon du Bourget 2015 with a couple of colleagues and in this post I will tell you all about it. I had a few reasons for attending the show. The first thing to motivate me was that the Dassault Falcon 7x would be on static display. This was important to me, as we are currently working on a new and improved version of the Falcon 7x at Cranfield, codenamed “E-15”. The second reason: Excellent timing! I would be graduating in July ’16 so I figured that this would be an ideal opportunity to look for jobs at the show. Finally, the third reason: Planes…flying…do you need a better reason to see them close up, performing crazy manoeuvres? I don’t. 🙂 staring at products of magnificent engineering could only inspire me even more to pursue aircraft design. All in all it was a fantastic experience and I absolutely enjoyed every bit of it! The above picture shows the AVD march 2015 intake (including myself) looking at the Falcon 7x and comparing its features to our E-15 specification. The Dassault Rafale was the star of the show, doing some wild aerobatics that have been made possible because of its incredible design! Too bad my phone camera wasn’t nearly as incredible, as it was too quick to take a snap.